This copy of the Four Gospels belonged to and was probably written for Goda (c.1009-1055), sister of King Edward the Confessor, as is shown by an added ownership inscription of Rochester Cathedral, which states that it had been hers. It was written by two scribes and the decoration was never completed, which may suggest that it was produced in haste. 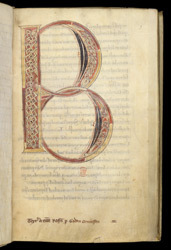 This imposing initial 'B' for the Epistle of Jerome to Damasus appears stranded on an almost blank page: the rest of the first few words of the text (Beato papae Damaso) were never executed. In the lower margin is the ownership inscription of Rochester, referring to Countess Goda ('Godam Comitissam').